Pyongyang Okryu Gwan Restaurant is a famous chain of bistro that belongs from North Korea and it is one of its kind as there are not any other North Korean restaurants in Dubai. The Dubai outlet of this restaurant is to be found in the business park of Deira region, where it serves authentic delicacies of North Korea. Despite being the only North Korean restaurant in Dubai, Pyongyang Okryu Gwan has wide-ranging menu that truly depicts the flavors of Seol, but they have kept the spices bit subtle. Well mannered and extremely friendly all-female staff of Pyongyang Okryu Gwan Restaurant is another highlight of this venue because these women can go even out of the way to console their guests. Aside from this, they even let guests pour their own drinks and entertain them with their delightful singing and drawings. In brief, visiting Pyongyang Okryu Gwan Restaurant is all together a completely different and joyful experience for any diner. This restaurant serves very rare North Korean food in the area of Deira, Dubai. Although there is not much different between South and North Korean gastronomies, but still this venue holds its authenticity by offering an extensive range of North Korean dishes, which are not that spicy as people in Seol prefer to consume. Their top of the line dish is naengmyon cold noodles, plus there is a decent variety of kimchi as well on its menu. Apart from this, pickled cabbage dish of this eatery is also quite popular. In appetizers, sweet rice cakes are pretty delicious. Then there are other dishes too on the menu of this bistro, which several customers love to eat such as tofu and gochujang plus meat and fish dishes. 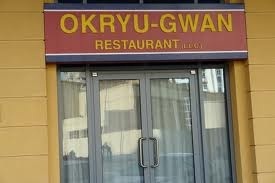 Pyongyang Okryu Gwan restaurant operates between 10:00 am and 11:00 pm on each day of the week. Al Rigga - Dubai - United Arab Emirates. Head north on Al Ithihad Road towards 8th Street, then turn left onto 8th Street and at the roundabout, take the third exit from where turn left. After that make another turn on the left side and destination will be on your right side after covering some gap. 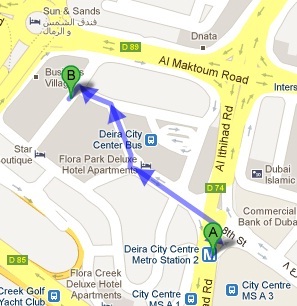 Deira City Center Bus Station is located 290 meters away from Pyongyang Okryu Gwan bistro, and by walk a person can easily bridge this gap between two spots in about 3 minutes. If a bus user heads west from this bus stop and then turn right, before making a left turn. After which he or she has to make another turn on the left side in order to get to the destination located on the right side few meters away. See map for directions.